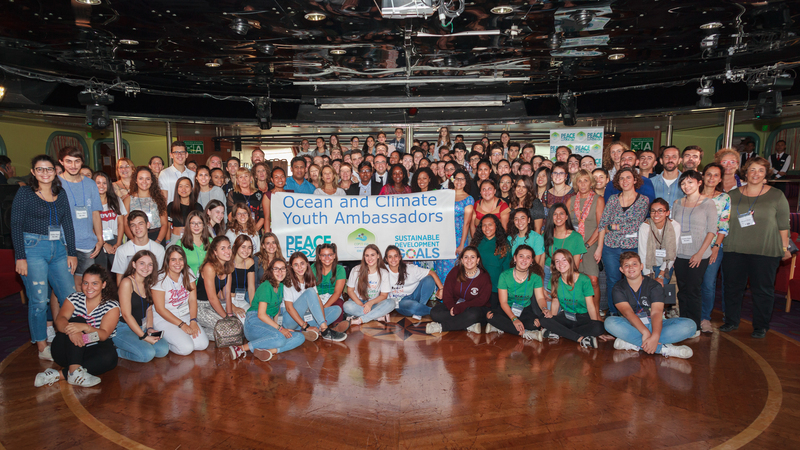 A group of young leaders from states on the front line of climate change and marine degradation joined Peace Boat’s 95th Global Voyage in Barcelona on September 22 as a part of a new programme to highlight these crucial issues and build momentum for climate action and the Bonn 2017 UN Climate Change Conference (COP23). These young women and men between 19 and 26 years of age are from the regions of the Pacific Ocean, Indian Ocean and Caribbean. In the next three weeks, they will visit Lisbon (Sep 25), Bordeaux (Sep 28), London (Oct 1), Edinburgh (Oct 3), Reykjavik (Oct 7) and New York (Oct 15). In every port, they will connect with civil society organizations and government agencies bringing their message to citizens and government representatives through the voyage. The participants are Kya Lal (Fiji); Selina Leem (Marshall Islands); Matea Nauto (Kiribati); Ashwa Faheem (Maldives); Shafira Charlette (Seychelles); La Tisha Parkinson (Trinidad and Tobago); and Zana Kristen Wade (Belize). All of them have diverse backgrounds in science, campaigning, public policy, civil society, grassroots and international activism. The group will share their skills and experiences, as well as the impact of climate change on their own countries. The Ocean and Climate Youth Ambassadors will be joined onboard by guest educators to assist in their capacity building, including Ms. Christiana Figueres, who was Executive Secretary of United Nations Framework Convention on Climate Change (UNFCCC) during the historical Paris Agreement of 2015, and the convener of Mission 2020. – In Barcelona, Spain, an event onboard Peace Boat’s ship with 150 students, organized in collaboration with the government of Catalonia and the Minister for the Environment, Mr. Joseph Rull. – In Lisbon, Portugal, an event will be held at the Science Centre of the Pavilion of Knowledge with Ciencia Viva with scientists, civil society and government, including Ms. Ana Paula Vitorino, Minister for the Sea. – In Bordeaux, France, the group will travel to Lacanau to learn about the rising sea level in the Atlantic Ocean. – In London, UK, an event with young climate and ocean activists, a press conference and an oceans exhibition will be organized in collaboration with We Are The Oceans to highlight the relationship between ocean and climate health. – In Edinburgh, UK, the Youth Ambassadors will join civil society groups, local authorities, Members of the Scottish Parliament (MSPs) and senior governmental figures. – In New York, USA, the Youth Ambassadors will report on their efforts to both the United Nations community and the broader public in a big festival onboard Peace Boat. 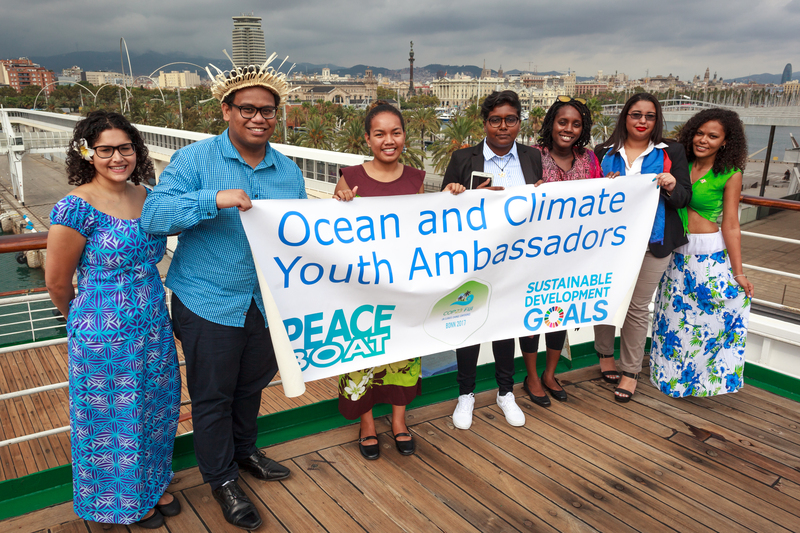 The Ocean and Climate Youth Ambassador Programme is an endorsed event of the COP23 in line with Fiji’s vision for the COP23, as recognized by the COP23 Presidency Secretariat. Peace Boat is proud to fly the flag with the official logo of the United Nations Framework Convention on Climate Change (UNFCCC) in conjunction with the COP23 logo on the mast of its ship from Barcelona, where the Youth Ambassadors will begin their voyage. It is the official emblem of the 23rd annual Conference of Parties (COP23) that will take place in Bonn, Germany from 6 to 17 November. Peace Boat is committed to working with the UNFCCC and the Fijian Presidency of COP23 to build momentum for climate action. Peace Boat is a campaigner for the 2030 Agenda for Sustainable Development and its vessel sails with the Global Goals logo on the side of the hull. The programme will connect the sustainable development agenda with COP23.